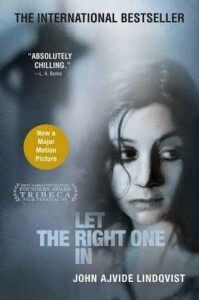 I saw the movie, Let the Right One In, last year and was immediately drawn in by it. The stark settings and minimal dialogue gave the film a sense of isolation and dread. Nothing good could happen in these surroundings. As soon as I found out the film was based on a book, I had to have it. It just took me a little while. Strangely enough, he already knew the name of his victim, and what he looked like. Jonny Forsberg with his long hair and large, mean eyes. He would make him plead and beg for his life, squeal like a pig, but in vain. The knife would have the last word and the earth would drink his blood. Oskar had read those words in a book and liked them. The Earth Shall Drink His Blood. Eli is impervious to cold, remarkably strong for a girl her age, and only comes out at night. Hmmm…. Eli also has a caretaker. A much older man, who may or may not be her father, and who has decidedly sketchy motives for associating with a young girl. Eli, we find out, is not above trading on those motives when she has to. Things become even more complicated when Oskar begins to suspect that the new family on the block has a connection to a recent murder. 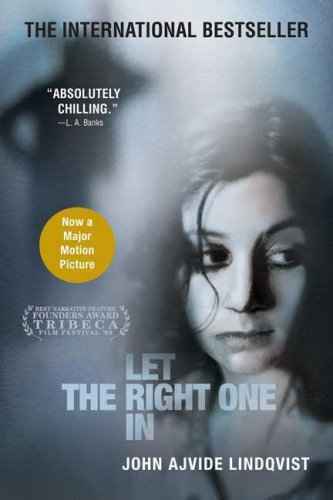 One body becomes two and a potential killer turns up in the hospital, horribly disfigured, and many more people are drawn into the devastating mix. Frequently, I find that I either love the book and hate the movie or vice versa. In this case, I found they worked together very well. If I’d read the book first, some of the scenes in the movie involving Eli’s history and Oskar’s relationship with his father would have resonated more deeply — there is a lot of subtext there, a lot going on below the surface, only hinted at on film. Seeing the movie first, I could place pieces of the story in a visual context, with my memory of the landscape and look of the places involved in the story. If you’re not familiar with either, I would suggest reading, then watching. I was fascinated by the book. I kept thinking about the relationship between Eli and Oskar. Eli appears fragile, but she is preternaturally strong. She is most definitely older than her years. She encourages Oskar to stand up to the bullies that make his life miserable, but what are her motives? The book fills in a lot of blanks — about Eli’s past as well as Oskar’s — but that doesn’t necessarily make the picture clearer. It certainly makes for a fascinating story. This sounds hauntingly good. Thanks for the great review. Boy, am I out of it – I haven’t heard of the book or the movie. There was a controversy last year when it came out on DVD because of the subtitles – there were reports that the subtitles were “Americanized” and very different from what the dialogue was in Swedish. I got the “corrected” version, and it is one of those films where the very sparse conversation often suggests a lot, without coming out and telling you anything.